The date the Prime Minister will finally be leaving office has been announced, and his successor, Gordon Brown all but crowned. Prime Ministers are such a part of day-to-day life, that when they change, it prompts you to reflect on their period in office, and how their tenure effected your own life. When Tony Blair entered Downing Street in May 1997, I was just under the threshold of being able to vote. I do remember the event pretty well, having lived my life up until that point knowing nothing but the Tory governments of Thatcher and Major. For a little while things certainly felt a little strange. At that time I was a closet Conservative, but even I welcomed the opportunity for some change in government and some new ideas. Hopes were high for this first Labour government in 18 years, if only because those hopes were raised by this fresh faced center-left social democrat who preached the third way. It didn’t take long however to work out that this government was going to be just as bad as the previous, if not worse given it’s agenda of ‘spin’. 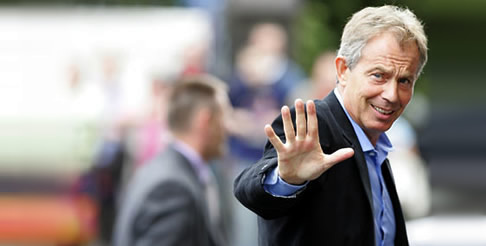 At the end of the day I can only comment on Tony Blair’s success, by looking at how Blair’s ten years effected me. My old secondary school became a ‘Technology College’, extensively refurbished and extended—yet also surrounded by a 10 foot high fence. TP Riley, a failing school close to where I live, was torn down and rebuilt as an ‘Academy’. This (privately financed) bricks and mortar can only count for so much. It’s what happens inside these buildings that really matters, and I don’t actually believe there has been as much improvement as Tony Blair would like to believe—and he can skew the numbers as much as he wants. I was a victim of crime on three separate occasions. The theft of my wallet and phone from Walsall Gala Baths, a robery at my former place of work, and more recently my assault in the center Birmingham, in which the police paid a passing interest. How connected these events are to Labour being in power I don’t know, it is quite possible that the same would have happened under any other leadership. I certainly feel less safe when in the UK than I did ten years ago, and our towns and cities almost seem to turn into war zones as soon as the night draws in. I started University during the first year in which students had to pay tuition fees (a cost that then increased year on year). I’m actually in agreement that those wanting to go to university should be responsible for it’s cost. The more recent update of this policy, and the privatisation of the Student Loans Company is a step too far in my opinion. I now live in a country that is needlessly at war with another, and with a governent that sides with George W. Bush, who is perhaps the worst thing to happen to western civilisation since the Cold War. It can be strongly argued, that thanks to this policy, we are probably at an even greater threat from terrorism than we would have been otherwise, and in an effort to combat that, we see a continual erosion of our civil liberties. I was always against going to war in Iraq. To me it seemed more like a US focused policy (after all it was stated aim of the Neo-conservatives to remove Saddam from power, and 9/11 was just the catalyst they needed to pursue that policy). I think this was the greatest error of Tony Blair’s ten years in power, and has come to reflect all that was wrong with his premiership. The constant spinning of information, whilst almost humorous to start off with, has become quite sinister when applied to the reasons for going to war (remember the ‘45 minute’ claim). I’m not sure where this notion ever came from, but political commentators have always talked about Tony Blair trying to ensure he left office with a legacy. Regardless of the domestic policies, which could be argued either way as to how successful they’ve been, the fact that Tony Blair lead us into a war, alongside a frankly crazed American leader, and presented this policy with plain lies, is inexcusable, and that will be his legacy. And he knows it.